Roku is one of the best streaming device. If you own one, you would probably know why we are saying this. It has a large amount of content and variety of cool features that make it different from others. It has introduced variety of devices such as Roku Express, Roku Express+, Roku Premiere, Roku Premiere+ and Roku Ultra. 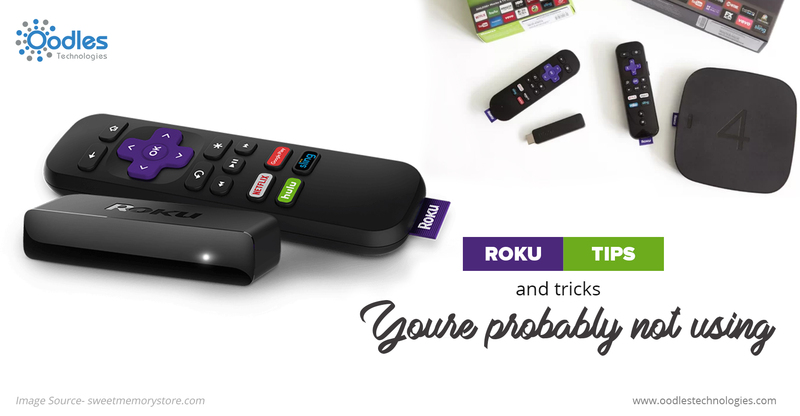 To get the most of your Roku box, we've rounded up 4 tips and tricks you probably didn't know. In Roku, the channels are shown you in the series in which you have added them. More channels you add, messier it will become. It becomes difficult to find that particular channel in the crowded library. But don't worry, Roku has a solution for you. You can reorganize the library according to your liking. To reorganize you have to find that channel and take the cursor over it to highlight that channel. Then press the options button given on the remote select move channel. This way you can take the channel to any place you want. After that, you just have to press ok.
Roku has the variety of channels for everyone. You can either choose from them or even unlock other channels which are usually hidden from the years. Those hidden channels are the apps which have not been approved by Roku officially. Hence they are not in the listing. The private channels are on Roku-channels.com, StreamFree.tv, RokuChannels.tv and RokuGuide.com. To unlock those hidden channels you will have to log in to the Roku website and then click on the add a private channel. Those individual channels will have their individual access code. To get the access, you have to enter that code. Got bored with by default screensaver? Well, you can change that boring logo screensaver moving around the screen whenever Roku is idle for long. You can choose an interesting and colorful piece of design to make your screen look amazing. Roku has set of three boring screensavers which are, bouncing logo, digital clock, and Roku Analogue Clock. To put any of them as your screensaver you have to get to settings and then select screensaver of your choice. If you want something interesting you can download it from the channel store. Using a keyboard can be the tiring job when you are in a relaxing mood. Roku app has come up with the voice search capabilities. Instead of typing, you have to speak a channel or show name you are looking for and it shows up in Roku's search immediately. If you have the latest Roku 3 and Roku 4, you are lucky because it comes with a remote that has an inbuilt mic and voice searching feature. It makes it easy in finding channels, shows or movies.